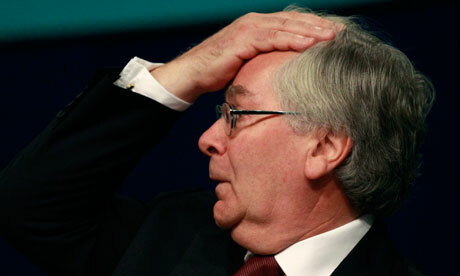 Mervyn King is surprised that people are not angrier! Oh joy, it is nice when someone agrees with me! Angry at the banks? Of course we are! When you’ve been going on about something for a while, it is always satisfying to discover that other people agree with you. I have been arguing for the last year that the banks, hedge funds and other titans of the City of London whose gambling got us into this trouble should pay to clean up the mess they caused. The evidence supporting him is overwhelming. The International Monetary Fund has warned that British government debt will be 40% higher as a result of the financial crisis. That’s equivalent to a total of £28,000 for every taxpayer in the country. But King’s subsequent comment that he was “surprised that the degree of public anger has not been greater than it has” suggests that either he had a very high expectation, or that he has misread the public mood. I’m an ambassador for the Robin Hood Tax campaign, which calls for a tiny tax of just 0.05% on every casino-style financial transaction in order to help poor people, reverse public service cuts at home and abroad, and tackle climate change. In this role I’ve seen how people’s sense of fairness has been stretched to the limits by the continued spectacle of huge pay increases and bonuses in big companies while ordinary people suffer. Every time people turn on the television news they are bombarded with stories of job losses, disabled children forced into care, public sector cuts or young people left without a future. Meanwhile one of the country’s leading bankers claims “the time for remorse and apologies needs to be over“. If there has been any remorse it has escaped my notice. Of course people are angry! Project Merlin, George Osborne’s agreement with the banks last month, was widely ridiculed because people are too angry to accept a backroom deal that does not address the fundamental issue of fairness. Our campaign is supported by Lord Turner, chairman of the Financial Services Authority, along with 250,000 Facebook users and 113 organisations from Oxfam to the Salvation Army. When, last week, I challenged bank chief executives Stephen Hester, Bob Diamond and the others, to visit people at home and abroad hit by the economic crisis, I was inundated with messages of support. More dramatically, Barclays – which recently announced a £6bn profit and a 20% increase in pay and bonuses – found 40 of its branches occupied by protesters on the day it was revealed that it pays just £100m in tax. Polls show this anger is felt by supporters of all political parties. A ComRes survey, carried out in January before the UK bonus season, found that 80% of people, including 76% of Conservative voters, want additional taxes on bankers’ bonuses. Polls regularly show majority support for a Robin Hood tax – it could be the most popular tax in history. Mervyn King is right, though, that this anger has not yet forced politicians to make banks pay their fair share. Perhaps this is unsurprising: many MPs have spent years seeing the excessive profits and bonuses of the City as a sign of economic health. But this does not mean it will not happen. French president Nicolas Sarkozy and German chancellor Angela Merkel have both responded to public anger by promising to go ahead with transaction taxes. Perhaps the biggest barrier to the UK following suit is the fear, endorsed by many commentators, that a higher tax burden would encourage banks to up sticks and leave. But this doesn’t bear scrutiny. According to the Bank of England, the banks benefit from our taxes and the subsidy afforded them by the government to the tune of £100bn every year. They also benefit from the City’s excellent infrastructure. The idea that they are about to give this up to move to Dubai or the Cayman Islands is incredible, especially when you realise we already have a 0.5% tax on share transactions. If the public see through banks’ scare tactics, their anger and their desire for justice really will force politicians to act. The FSA now has a plan that allows banks to fail! Finally someone from the mainstream, Dan Baker – ﻿﻿http://www.guardian.co.uk/commentisfree/cifamerica/2010/sep/20/tarp-bailout-banks-wall-street has been published stating what many of us knew to be a reality – the banking system was not in crisis, the bankers were! Over the last 30 years there has been such a brain drain into financial activities that add no value at all to the society that I would have no fear for its future if the financial sector shrank considerably. I long for the day that an engineering graduate or a maths graduate actually have a wider choice of potential careers. one thing is for sure, they would have more of chance of adding value to society if many of the casino-like activities of the financial sector disappeared. UK, last 20 years. Bankers freed from regulation shower politicians with money and jobs after politics. Politicians continue to deregulate the financial markets. The financial markets run wild and start heaping debt on to debt of ever more spurious pedigree. No one is worried because everyone is making money. Suddenly the whole thing explodes. The bankers are now in a position to ask for favours under threat of devastating the economy. 1 trillion of favours. The Bank of England reduces rates and starts pumping in money to keep up the bond prices. Woe betide us if they ever fell. Finally, only in the last few days have articles appeared that state that Governments are helpless and that with no more to borrow they can do nothing if the developed economies slip into recession again. Where are the bankers now? The bankers are on their boats mate! This is either stupid or disingenuous. Banks made bad loans because an investment bank would then, for a large commission, underwrite (using their prop desks) the repackaging of these loans to others – hedge funds, other banks etc.. Banks therefore could make any loan and flip it keeping the fee and moving on to the next borrower. How hedge funds and prop trading didn’t contribute to this I do not know. I can certainly excuse Private Equity from the equation – these guys are mostly borrowers and are in any case unrelated to the banks. One very interesting and tricky issue is how can splitting up the banks by itself offer a solution to the securitisation of these loans? The answer, and Myners is right here perhaps (although he hasn’t given this as the reason), it doesn’t. Stopping banks from making mad loans and flipping them is best curbed by either capital requirements or outlawing the activity by forcing banks to hold a significant portion of all loans that they make. Obama is a big disappointment. Never has someone offered such hope and disappointed more. As a master of politics he is becoming rather transparent. Two examples, first a call for a world without nuclear weapons for which he won the Nobel peace Prize (while continuing two wars perpetrated by the Bush regime). Second a call for a total freeze on all settlement growth in Palestinian occupied territories including what is termed as “natural growth”. Both these statements were clearly ridiculous. Most recently we have “break up the banks!” It won’t happen. If I had the cash I would be long in banking shares and would have been for at least 6 months. Politicians don’t depend upon people’s votes but on the support of business and in particular the bankers. What is wonderful about this statement is that the breaking up the banks if not easy – there is a huge grey area between taking deposits and simple lending and the more exotic activities such as securitisation. This gives Obama a lot of room to negotiate with the inevitable opposition yet still come out with a win or at least what can, in time for the next election be termed one. In my view banks that take deposits should not be able to carry out any activities apart from lending to individuals and businesses. I would exclude proprietary trading of course and any equity investments. In addition I would exclude any commission-based activities such as underwriting, broking and M&A. The later are best practiced by independent operations with no conflict of interest as it most often described (what I would describe as “unfair advantage or even insider trading”). Who is going to support that? The people yes but politicians….? You just be joking. Viva la revolucion! Anyone who questions the way the banks were saved is asked by the incredulous interviewer whether it was better to let the banking system fail. Well, the only response to this question is clearly no. This does not mean that there wasn’t a better way. Did you know that on 15% of RBS’s balance sheet relates to UK commercial and consumer lending? I recently pointed this out to the opposition Treasury spokesmen and have sent a note to the Economist. My email asked the simple question, if we want to ensure that UK commercial and consumer banking is saved then why not focus on the 15% that this represents not bail out the 85% that it doesn’t? Corporate law and Government powers would have enabled the Government to let all banks that couldn’t survive go into administration. Of course this wouldn’t have been done without giving depositors 100% loss protection. Once in administration the Government would have nationalised the UK commercial and consumer banking operations and let the administrator and subsequently the liquidator sort out the rest. This would have cost a fraction of the supposed £200bn that the IMF suggests that the bail-out will cost the Government. Why has this not been discussed? I can make a few guesses.